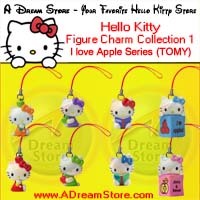 A Dream Store, Inc. is the place you can find your dream toys. 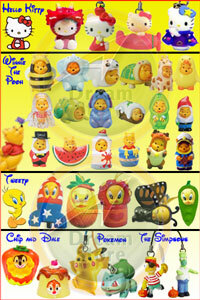 We have more than 100 different kinds of capsule toys from different manufacturers all over the world. The capsule toys are from 1 inch height and up. They are included Cartoon figures which like Winnie the Pooh, Peek-A-Pooh, Hello Kitty, Chip and Dale, Dragon Ball, the Incredibles, Robots, Pixar moive, and more in stock. 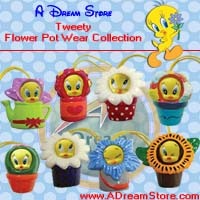 The latest figures that were added into our products are Tweety and Tea Dog. We have a large collection of Homies and Homies related items such as Trailer Park, mijos, Lil locster, hood hounds, dog pounds, and more. The newest one is Lil Locster series 7. In additional, we do carry metal tin signs. You will find your DREAM here at A Dream Store. We have a hugh selections of Action Figure. Some of the Action Figure toys are directly imported from other countries (ex. Japan). And most of the figure action toys can fit into 2" capsules (Please see the details for each action figure set). Nowaday, these toys in capsule are most faviorite toys. Some of them are highly collectible, limited edition, and/or licensed. These will include 'The Robots' 6 pieces figures, 'The Incredibles' 8 pieces action figures, 'Dragonball Z' figure keychain, Licensed 'Winnie the Pooh' figure collections, and etc. As a reminder, we offer FREE SHIPPING (Please read the terms and conditions) while ordering from our website. The popularity of these Figures is excellent! In our Homies collections, we have more than 100 different styles of homies figures available. Price starts at $1.00 each figure of homies. You can choose to buy from single Homies Figures or Complete Homies Figure Sets if they are available. We do have the Large size of Homies Figures for sale. Want to know the name of the homies figuring, you should have a Homies Family Posters. It means that we do carry Posters for your selections. Also, we have other homies related items like Mijos, Palermos, Dog Pound, Lil Locster, Hood Hounds, and Rascals. They are also wonderful to be one of your collections. Tin Sign: We carry over 100 metal tin signs (vinyl-wrapped) starting at $7.49: Automotive, Baseball, Bathroom, Christmas, Clothing, Famous Personalities, Farm Equipment, Flowers and Seeds, Food and Beverage, Illustrators, Liquor and Tobacco, Medicine, Miscellaneous, Motorcycles, NASCAR, Oil and Gasoline, Other Transportation, Outdoor Activities, Railroad, and Other. We take pride in offering the finest quality selection of over 100 images tin sign that are available for immediate delivery. We attempt to obtain the most popular classic advertising tin images signs as well as the favorite license images such as Betty Boop, & Elvis Presley. We try to prevent any tin sign from being scratched as much as possible. We try our best to ship orders complete, but unfortunately some signs are not available for shipping due to availability. We do not do back order, and please do request you re-submit your request.